Andy was murdered on December 23rd, 1998, while trying to break up a fight at a restaurant frequented by University of Ottawa students. He was celebrating the end of exams with his friends, hours before he was to drive home to spend Christmas with his family. 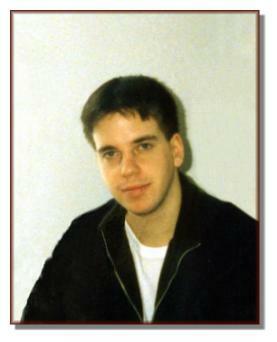 Andy was a 23 year old Computer Engineering student at the University of Ottawa, who worked part-time at Nortel with his brother Rod Jr.. Andy enjoyed many sports including softball, golf, hockey, football, tennis, darts, pool, snooker and skiing. He also enjoyed hacking on his Linux workstation, playing chess, programming, experimenting with micro-controllers and playing multi-player computer games like Quake2. Andy was off to a great start, and was soon to graduate to be an Engineer like his brother Rod - he had such a great life with so much potential. In memory of Andy, the Faculty of Engineering and Andy's family have set up a scholarship in his name. The scholarship will benefit engineering students at the University of Ottawa. You can read more about Andy's scholarship here. Andy was honoured in 2003 by the Governor General with a Medal of Bravery for the heroic act that cost him his life. As a result the letters 'M.B.' are shown after Andy's name. This web site was created to preserve Andy's memory, at least in an electronic form, so that others can learn about this great man.